Sourced and crafted from soft, supple leather and 192 pages of high quality paper, this leather journal will become the constant companion of anyone who receives it, as they use it to journal, take down notes and reminders, and connect the imagination to the written word. Craftsman Top Grain Leather, Lashing Closure. 192 Lined High Quality Pages. Gift arrives presentation-ready with a hand-fastened satin ribbon. A free card with your personal message is included with your gift. Free Embossing! One line with up to 10 characters. Enter information to be engraved using the personalization option during checkout. Embossed Fine Leather Journal is a hand delivered gift. These gifts are delivered by one of our local design centers located throughout the United States and Canada. Same day delivery is available for most gifts when ordered before the cutoff time. The cutoff time for Embossed Fine Leather Journal is 2 PM in the recipient's time zone. Refined, vintage-style leather journal, handmade in the USA. Complimentary embossing of your chosen name or message on cover. Arrives presentation-ready with a hand-fastened satin ribbon. Given as a gift, so I did not personally see the item. But I am giving it 4 stars because the recipient loved it; liked the design and the embossed name for personalization. The recipient was very pleased. I still am amazed at the exceptional Gift Selections for just about EVERY occasion, recipient relationship, and pricing. In less than 48 minutes I had a Gift chosen, I had it Personalized, and included a Personalized Note Card, had a paid receipt in my hand, spoke to a warm live, and very personal representative, that didn't sound like a non caring person reading a script, and actually had a sense of humor , and was told my order was ALREADY processed, in WA., will be sent from N.C., and will be in my Daughter's hands in Phoenix AZ. TOMORROW !! . And I did ALL of this from Columbus, GA. !! Are You Kidding Me ??? I hope this isn't a Dream..but wait a minute ... I just got a personal Email from this Company confirming ALL of the ABOVE !! You Guys don't have enough STARS Above to appropriately Rate this One of a Kind Service. And I can Promise anyone that had the patience to read all of this that NOONE paid me to do it !!!!! Very happy with this gift for a colleague. The wrapping was very nice and the embossing was done very well. 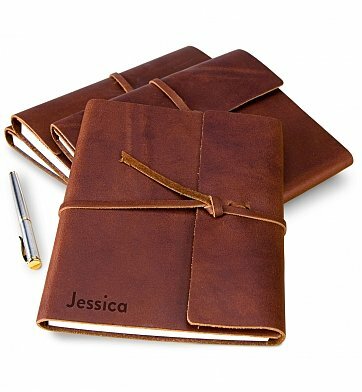 I would recommend this item to anyone looking for a quality leather journal with a special personalized touch. I purchased this item for a client. She loved the look, feel, and personal touch on this product. Would definitely order again! Received leather embossed journal - just as promised. Terrific service and absolutely love the item. Very good price for quality as well. Couldn't be happier. This is a lovely gift. The personalization adds sentiment and added charm. Thank you Sooo Much !!!! This Journal is just in one word: perfection!!! The Journal is beyond perfect and my Husband Loved the embossment so well done as well as the really Great quality of the leather and paper !!!! It was perfectly wrapped as well... Sooo Classy !!!! Really !!! I am soooo happy with it and I would definitly put more stars if I could !!! I purchased this Leather journal for a friend who likes to write poetry and he loved it. I would definitely shop here the next time I need another gift. I sent this as a gift to someone who has been hospitalized for significant time. I have not laid eyes on the product or have any idea what it looked like when it arrived. The recipient enjoyed the gift very much! I want to personally thank Jason in customer service. My original item shipped to the hospital where the delivery was originally accepted, then declined and returned to sender. Jason was awesome with rectifying the situation and helping me to get this gift to my loved one! He was professional, understanding, and extremely helpful. Great customer service! Hopefully, most will never need to have the service I did, but if you do, you are in great hands who will go above and beyond to resolve your issues/concerns! Thank you to Jason! I got this as an anniversary gift for my husband (1 year = paper) and he LOVED it! It came packaged beautifully and he loves it so much. He won't use it at work because he wants to save it for "special things" he has to write. Great gift, good price, great quality. I will purchase from GiftTree again. Got this for my husband's birthday. The quality is awesome! This is, also, the 5th one I have purchased for birthdays. Everyone has raved about the leather and the name imprinting, as well as the number of pages. A very durable and unique keepsake. Thank you so much. Bought for terminally ill friend in Texas to log his medical journey and leave fond memories for his loving wife of 30 years. He was so touched to have such a personal and beautiful journal. Excellent presentation and quality. Definitely recommend this journal to anyone looking for something special for someone special. Gave this as an 18th birthday gift for my son. He loved the quality of the leather and the personalization. I purchased this as a gift for my son. He loves it!!!! It was delivered on time - his actual birthday! I am so very pleased with the product. I bought this gift for my boyfriend; it was Valentine day. He has a particular taste, so it is always difficult to find something. The way GiftTree delivered this gift was beyond what I imagined. I am very difficult to impress, but I was. The journal even had a white bow, and the quality was incredible. Keep up the good work, I will buy from here more often now. Thanks so much. Krista was thrilled with gift of journal bearing her name. Beginning of a new chapter in her journey as a successful writer. Beautiful journal. Will make a wonderful retirement gift! I bought this for my daughter and one for her boyfriend. They both love to write and keep journals. I think this is going to be a huge hit for Christmas. The journals are beautiful and well made. The product exceeded expectations, arrived quickly and will make a great gift for clients this holiday season. The personalization also turned out beautifully. I highly recommend this product and am so glad I ordered an extra for myself! I admit I was worried after I ordered it because reviews elsewhere on the web weren't all favorable. But it arrived a day earlier than expected, was packaged nicely, wrapped with a bow, and had my printed card attached. I was excited and gave it to my husband (first year anniversary gift) a couple days early and he loved it. He especially loved the embossing. I will recommend GiftTree.com to other people. I purchased these for our leadership team as part of a leadership professional development day. We were asked prior to the day to pick a word that we would want to wear on a t-shirt for the rest of our lives. I didn't know who chose what word but we had the words embossed on the journal. When each person identified their word and spoke about why they chose it they were presented with this as a leadership journal. I bought this journal for my sister. The journal is meant to be her diary to write down experiences while she stays in the U.S. The presentation was simple but striking. The journal itself and the embossing is high quality. She is really happy with this gift. My daughter loved the embossing. This gift was exceptional and the recipient really liked it. I bought this for my husband as a gift for Father's day. He is very particular in general about gifts and I am always unsure of the quality and craftsmanship when I order something online. But this turned out beautiful and was what I was hoping for and expecting. He loved it. I think it is great too that it is made in the USA. I would definitely recommend this to others. Also, it got here exactly when they said it would. I bought this as a gift for my niece and had it sent to me first so I could check it out. It is very nice! Real leather and very nice presentation, I can't wait to see what she thinks! Bought this for one of my best friends and she absolutely loved it. The leather is strong, the embossing is well done, and the overall presentation is wonderful. Now I want to buy one for myself! I have not seen the journal personally, but I ordered it and had it delivered to my 9 year old granddaughter and she said she loves it. My only problem is that it arrived a day later than originally promised. Gave gift to a friend of mine. It was an awe- inspiring moment to see his reaction when he opened it. Just seeing his name on the journal warmed his heart. This season I ordered 6 of these leather journals for friends who graduated college. They look great, arrived amazingly fast and everyone loved their gifts. The price was right too. I will order these again when the occasion arises. It was even nicer in person and wrapped with a lovely ivory bow...perfect graduation gift! The journal is perfect! Nice thick leather and beautiful engraving. I purchased this as a high school graduation gift for a friend. She absolutely loved it! High quality, functional, beautiful design. Journal was a big hit with my wife as part of her Mother's Day gift. The embossing came out beautifully. I would recommend this to anyone. Very beautiful design that made for a great graduation gift. Knocked it out of the park with this gift. This journal is a great gift for anyone who loves to write or loves items like this and the free embossing is such a great idea! my girl friend has a habit of writing diary and i gave her as valentines day gift; she was more than happy it was niceeeee!!! Both of my bosses said the gift will be put to good use! It is a lovely journal with attractive embossing. It arrived very quickly and after sending it to 4 different people who LOVED I know it is a perfect and thoughtful gift. i love this product my friend is a writer and she gets ideas at the oddest times so i got her this joural and she LOVED IT!!!!!!! !